This Coffee Cake Banana Bread is both Coffee Cake and Banana Bread mixed into one! It’s light and fluffy, yet moist and decadently rich. Every single bite will blow your mind. This Coffee Cake Banana Bread has a super moist banana bread base, two cinnamon-sugar swirls, plus a crunchy cinnamon crumb topping. If you ever crave dessert for breakfast (please tell me I’m not the only one…), you gotta bake off a loaf of this deliciousness. This Coffee Cake Banana Bread makes for the best breakfast! But really now, it makes for the yummiest pick-me-up breakfast, lunch, afternoon snack, and dessert. Preheat the oven to 350 degrees Fahrenheit. Spray a 9x5" loaf pan with cooking spray and line one way with parchment paper. For the Topping. In a small bowl, stir together the erythritol, oat flour, and cinnamon. Stir in the melted coconut oil and stevia extract. Mix until even, then place in the freezer while you make the rest of the recipe. For the Cinnamon-Sugar Swirl. In a small bowl, whisk together the erythritol and cinnamon. For the Banana Bread. In a medium-sized bowl, whisk together the sorghum flour, oat flour, baking powder, cinnamon, and salt. In a stand mixer bowl with whisk attachment, add the mashed bananas, almond butter, eggs, vanilla extract, and stevia extract. Mix on medium speed until completely even. Scrape down the sides of the bowl, then add in the almond milk. Dump the dry ingredients into the bowl and mix on medium-low speed. Scrape down the sides of the bowl and mix one last time on medium-high to make sure everything is fully incorporated. Pour ~⅓ of the batter into the prepared loaf pan, then sprinkle on ½ of the cinnamon sugar. Spoon ~⅓ of the batter all over the cinnamon sugar, then sprinkle on the remaining cinnamon sugar. Spoon the last ⅓ of batter over the cinnamon sugar. Take the Topping out of the freezer and crumble it all over the batter. Bake for 1 hour and ~15 minutes, or until the surface of the loaf has browned and is firm when tapped. Let cool in the pan for 1 hour, then transfer to a wire cooling rack to cool completely. Slice, serve, and enjoy! Store in a tightly sealed container in the fridge for up to 4 days. This healthy Coffee Cake Banana Bread is a hybrid between two classic breakfast treats — Coffee Cake and Banana Bread! It’s soft, fluffy, and perfectly sweet. Filled with a cinnamon-sugar swirl and topped with an addictive crumble, one bite and you’ll have a hard time believing it doesn’t contain any butter, white sugar, or white flour. 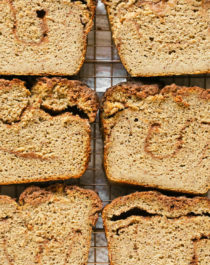 Oh so flavorful Coffee Cake Banana Bread without any of the butter, sugar, gluten, or dairy. Yes, it’s possible! This look amazing, I can’t believe that it doesn’t have sugar! How delectable! Coffee cake AND banana bread are my two favorites. I can only imagine how aromatic and lovely the smell of your kitchen was when you took this loaf out of the oven. I know that if I baked this bread every day, I would NEVER leave my kitchen. Truth!